PART ONE: Osterley station through along the east side of the Osterley Park, turning west along the Grand Union canal to Norwood Lock. On a grey late winter's afternoon, we decided on impulse to take the tube out of town to Osterley, some 30 minutes out of central London on the Piccadilly Line. Because there was no time to summon up the urban75 massive, this has to go down as an 'unofficial walk'! We had to change trains at Northfields, two stops away from our destination. 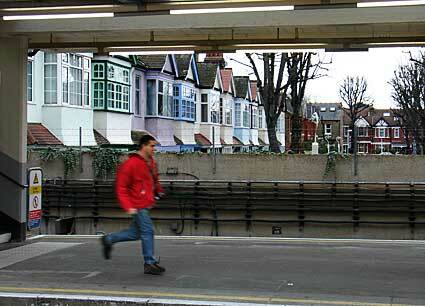 I loved the row of brightly coloured, 30s suburban houses behind the station platforms. The park is a ten minute walk from the station, past rows of well-kept, middle class houses where the owners seem to be in competition with each other to add the most tacky features. On our route to the park along Bassett Gardens we passed a garish collection of flamboyant wall lamps, under-nourished fountains, ostentatious ironwork and dubious sculptures. There's a small doorway in the park boundary wall at the corner of Bassett Gardens and Jersey Road, and as soon as you step over the curiously placed ankle-threatening pipe, it's like stepping into a different world. 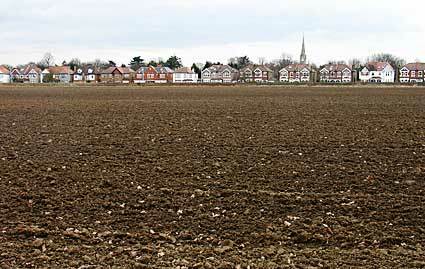 Here's a view looking south onto Jersey Road from inside the park. The walk takes you eastwards through the perimeter of the park, before taking a less-pleasant section along Windmill Lane (B454) and then underneath the thundering M4 motorway. 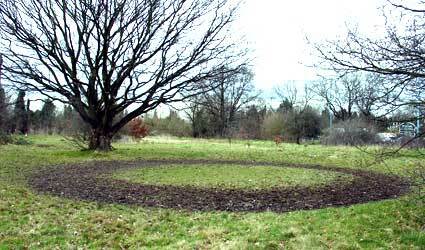 We joined the road close to the Hare and Hounds pub and spotted this circle in the grass made by horses being trained. After turning right off Windmill Lane, we walked along a narrow path, squashed in by the high fence of a sports fields to our left and the decrepit low fence of Wincott Farm to our right. We crossed the single Southall - Brentford Dock track freight line by Trumpers Way, Hanwell, navigating an assortment of different gates. The walk took us along Trumpers Way, hosting an ugly industrial estate, before we turned left on to the Grand Union Canal and headed north-west. Opened in 1805, the canal began life as the Grand Junction Canal, created to link the river Thames with the Oxford Canal at Braunston. This was later connected with another canal from Birmingham towards Warwick. 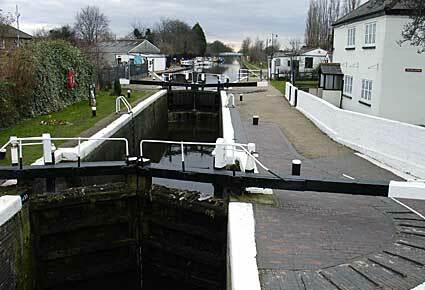 The entire system, including various 'arms' or branches, was renamed the Grand Union Canal in 1929, with the towpath being designated as a walking route in the early 1990s. The canal was a busy route throughout its commercial life, although competition with the railways became a major problem from the mid 19th Century onwards. Nationalised along with other canals in 1948, the Grand Junction was one of the last in Britain to keep commercial traffic alive, although it went into a steep decline through the 1950's when road transport developed. It has always remained open to traffic and now remains popular with leisure craft. Created by William Jessop, the Grand Union's Chief Engineer, this engineering masterpiece is now a Scheduled Ancient Monument. 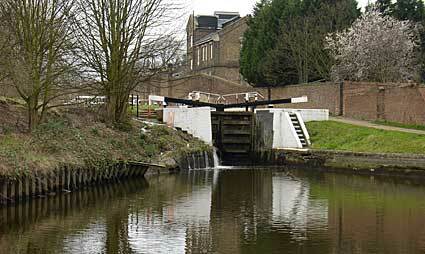 The Hanwell Flight of six locks, created in 1794, raises the water level by about 53ft over half a mile. 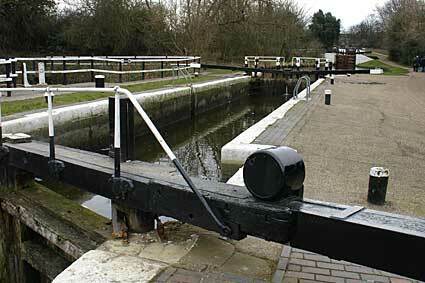 Each lock was built to accommodate one 14 foot wide barge or two 7 ft wide narrowboats side by side. Despite the rather chilly weather, we had a delightful picnic sat on the lock, and watched as a canoeing club went by, dragging their fibreglass boards along the towpath. 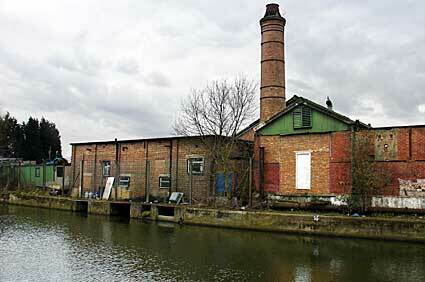 Four of the original lock keeper's cottages are still extant by the canal. 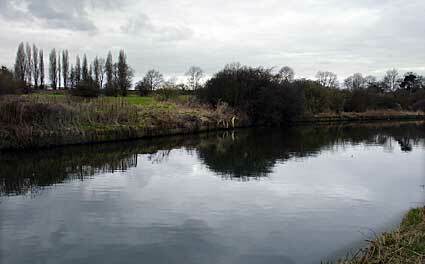 Most of the locks have 'side ponds' beside them opened for use in about 1816 as a means of saving water. You can also see short flights of steps around the lock pounds - these were built to aid the rescue of towing horses that had fallen into the canal. 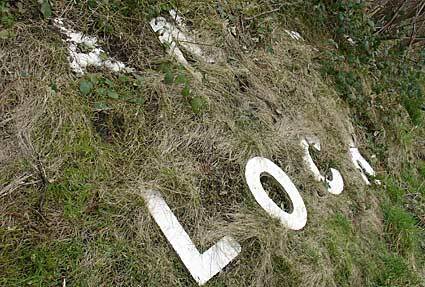 Almost lost to the undergrowth is this collection of crumbling letters that once spelt out 'Hanwell Lock'. 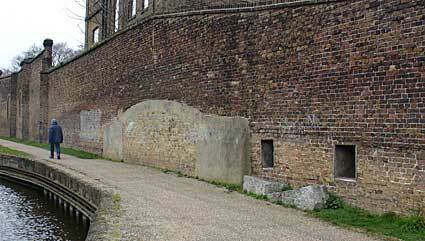 The filled in entrance marks the former entrance to Asylum Lock, where boats delivered coal for the hospital boilers. The hospital was self sufficient in fruit, vegetables and animal produce, with the surplus was taken away by boat to be sold. 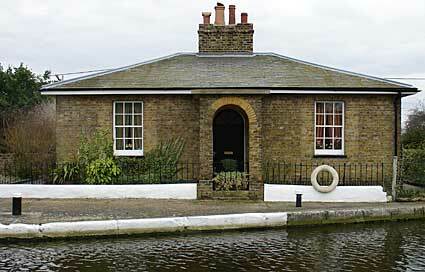 I loved the simple, classical proportions of this Victorian Lock Keeper's Cottage. 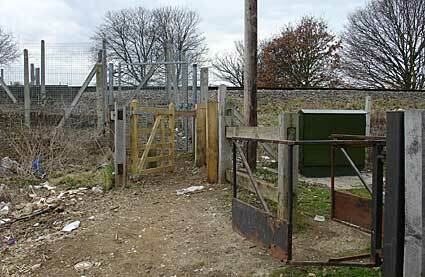 It may not seem much from this photo, but this bridge - one of Brunel's last major project - was a daunting challenge. 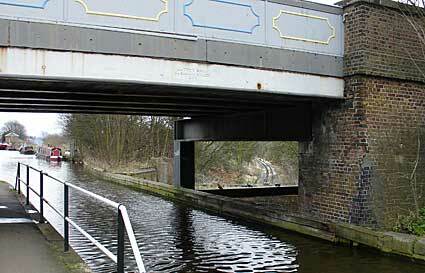 The structure comprises of two bridges, with road, canal and rail transport routes all intersecting at different angles. 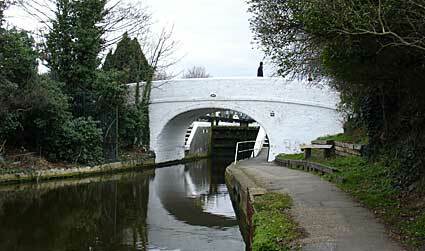 A bridge already carried Windmill Lane over the canal before Brunel cunningly planned to take the Great Western Railway line through a cutting under both the canal and the road. Brunel accomplished this tricky engineering feat by designing massive brick arches at the lower level and a 'trough' supported by huge metal beams to carry the road above the canal. The bridge is now a Scheduled Ancient Monument. 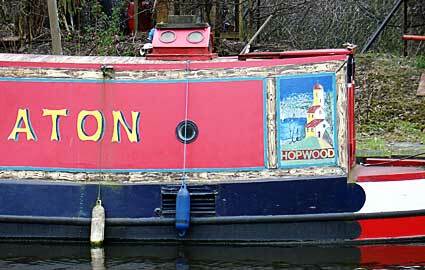 Detail of the customised artwork on this narrow boat by Norwood Top Lock. 'This bridge is insufficient to carry weights beyond the ordinary traffic of the district... owners and other persons in charge of locomotives and all other ponderous carriages are warned against attempting to pass over the bridge'. Looking west over Norwood Top Lock from the White Bridge. 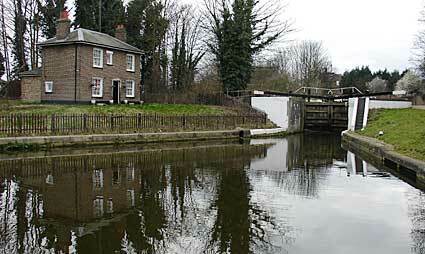 The Lock Keeper's Cottage can be seen to the right.